Chilles & Peppers - Website of yvonnes-plants! We love chillies and peppers. This year we have over 200 varieties, from the sweet bell, long and mini peppers, through a wide range of chillies from very mild, all the way up to the infamous Carolina Reaper and its challengers for the title of Worlds Hottest Chilli. The cards below show all our varieties, grouped according to heat, and all the plants are invidually labelled, showing whether it is a pepper or a chilli, and also the variety name, colour, size and heat level. Peppers and chillies can be grown outside in warm and sunny locations, BUT the hotter the chilli variety, the more heat it will need to grow and produce a crop. So something mild like a Padron should do well, a cayenne may produce a reasonable crop, but anything hotter will struggle. I would never recommend growing the superhots (aka nagas) anywhere other than a greenhouse, polytunnel or a well lit and warm conservatory. There are more tips for growing to be found on the cards below. If there are specific varieties you are after, then please get in contact with us 3 or more days in advance of the event you want to collect the plants at, and we'll make sure the plants are ready for you on the day. Our chillies and peppers are available in 9cm pots from the end of March to June, along with complete kits for growing certain varieties in hanging baskets (perfect for novices and those with limited growing space). 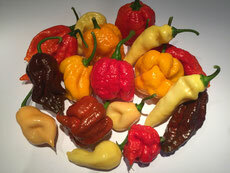 Due to the heat needed for the naga chillies, they are normally only available from late April onwards, but as ever, this is dictated by the weather conditions we get this spring. During the summer months we are at Chilli Festivals and other events where we will have the chillies in much larger pots, with some of the plants being up to 3ft tall and literally dripping with ripe chillies. We'll also have the fully grown hanging baskets, and a huge range of fresh chillies and peppers ready picked for you to enjoy at home. There will also be dried chillies of all heat levels, and for the first time ever, we have our own range of chilli powders available (thanks to a truly bumper harvest in 2018). So even if you haven't got a garden, or you struggle to grow your own chillies, you can still bring a bit of heat into the kitchen.